The stunning announcement on Monday of the sale of The Washington Post to Amazon founder Jeff Bezos caught many off guard. The Post has been owned by the Graham family for 80 years. 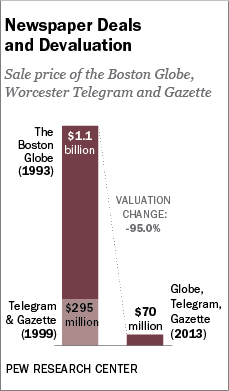 But recent years brought steep revenue and circulation declines and as chief executive Donald Graham put it in a letter to the staff, “the newspaper business continued to bring up questions to which we had no answers.” In Bezos, The Post—and a handful of smaller papers owned by the company—get an owner who is considered one of the most successful business and technology entrepreneurs in the country. Bezos is considered to have a strong understanding of audience needs and the financial wherewithal to tolerate sluggish revenue numbers, at least for a while. Still, the challenges are large and not unique to The Post. 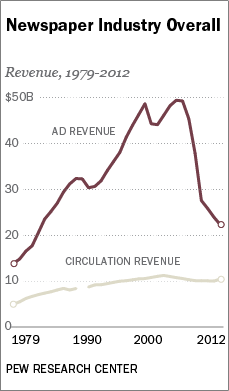 Pew Research Center’s Journalism Project, which has been tracking the industry for over a decade, puts the sale in context.